Renting a luxury Caribbean villa or private home can be a great alternative to booking a hotel whether you are traveling to the Caribbean as a family or with a group, cherish the experience of immersing yourself in the local culture and community, or are looking for more privacy and autonomy than a resort can ever offer. If you're intrigued by the idea of a villa rental but a bit daunted by the process, heed this great advice from our experts. Choose the right island. You'll find villas for rent in most Caribbean destinations, but not all islands are created equal, and some are more known for the quantity and quality of their villas than others. "Anguilla is very quiet but has great food, for example, while St. Martin is more lively with bars and casinos," notes Heather Whipps of villa booking agency Luxury Retreats. Regional flights and ferries can add significant cost to your vacation, notes Bennet, so look at destinations with direct flights from the U.S. such as Turks & Caicos, St. Thomas, Puerto Rico, Barbados, Jamaica, Grand Cayman,​ and St. Martin. Find a villa booking agent. You can scan the Internet for websites of individual villas, and some travelers prefer to rent directly from villa owners. However, it's simpler to go through a villa-rental agent like Luxury Retreats, Jamaican Villas by Linda Smith, Hideaways, WheretoStay.com, Villas of Distinction, or Wimco Villas. Rental agents not only can book your villa but can meet you at your destination and help with air travel, car rentals, finding chefs, arranging tours, etc.. Experts like Linda Smith have lived in their properties and can tell you everything from the wattage of the light bulbs to the cook’s most mouth-watering specialty. Villa layout can be an important factor depending on who you are traveling with, so communicate that to your booking agent. Families with older travelers or toddlers might like single-level properties, for example, while couples would surely appreciate a villa with multiple "pods" for extra privacy, notes Whipps. If traveling with another couple, ask if there are two equal master bedrooms. "You don't want to be flipping a coin to decide who gets the big bedroom with the spectacular view, or deciding who should pay how much extra for that privilege," says Mike Thiel, founder and CEO of Hideaways International. If you want to save money, consider booking a villa in the shoulder season. Villa high season runs generally from Dec. 15 to April 15, and you'll pay about half price during those "magic weeks" just before or after. If you are planning a holiday getaway, book early. Some travelers wait around expecting last-minute deals, but that can be risky because owners often use their villas themselves if they don't get a booking. Most renters secure their villas for the holidays by late summer. Don't let the price daunt you -- just do the math: Per night, villas might seem pricey versus hotels, but remember that you get all the bedrooms for that one rate. Villa rent, meals, and alcohol may turn out to be far less than hotel or resort costs, says Smith Divided up, it often works out to a better deal than a resort, "plus you get the whole pool to yourself," adds Whipps. A cute cottage in Jamaica can run as little as $1,900 for a week, says Smith, while a lavish mansion can easily set you back $25,000. Consider the privacy factor, one of the prime advantages of renting a villa versus a hotel. On vacation with your family, nothing compares to having everyone under one roof, rather than spread out down the hall, Whipps says. "Parents love being able to put the kids to bed and still enjoy an evening by the pool or in the hot tub," she notes. Calculate how much that's worth to you, and budget your trip accordingly. If you really don't want to lift a finger, look to Jamaica, Barbados or St. Lucia -- almost all villa rentals there include a staff with cook and maid. You just pay for the cost of food. 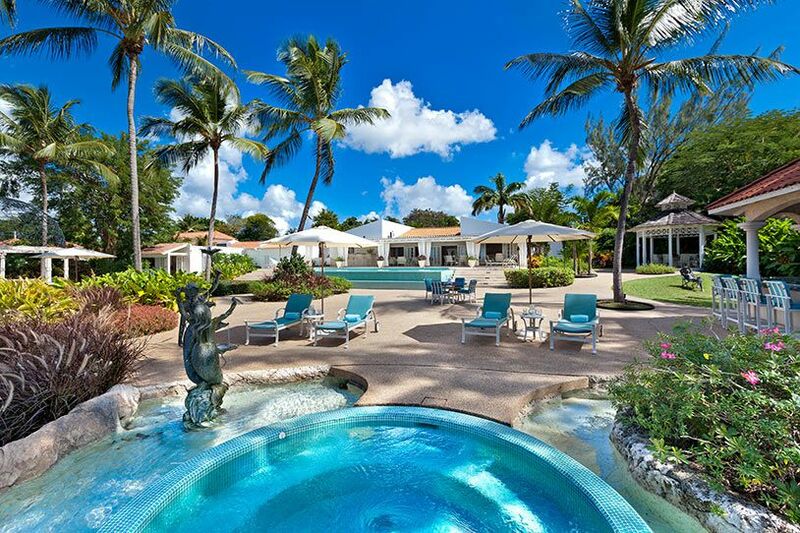 "For no additional money, opt for the luxury of having your own cook, butler, chambermaid, personal laundress, and gardener to skim your private pool and rake your beach," says Linda Smith. Look for a villa with a long-serving staff: "The longer the tenure the happier the staff is likely to be and probably the better they are," says Thiel. For bang-for-the-buck in beach destinations, check out the Riviera Maya. Many villa owners are also now offering promotions to lure travelers scared off by the swine flu and security concerns. Don't be afraid to ask for good value. "You have nothing to lose by asking for what you want," says Stiles Bennet, vice president of marketing and sales at Wimco. "Ask if the villa rental company can throw in a bottle of wine as a welcome gift, inquire about villas that come with a free rental car, ask if you can get complimentary airport transfers." In St. Barts, for example, vacationers renting through Wimco get a dining card that gives them a 10-percent discount at select restaurants. Ask for "breakdown" rates, adds Bennet. "Just because a villa is advertised as having three bedrooms, doesn't mean that you have to pay for all three," he says. "Vacationers should always inquire whether a larger villa has breakdown rates, which allow you to pay only for the bedrooms you need. You still reap the benefits of renting a larger villa, more spacious living rooms, kitchens, pools, and patios for example, but at a price you can afford." Lots of neophyte villa renters angle for a villa on the beach, says Thiel, but in the Caribbean, hillside villas are often superior -- there are fewer bugs, better breezes, and better views. Check how long a walk/drive it is to the good beaches before booking a villa away from the ocean, though.